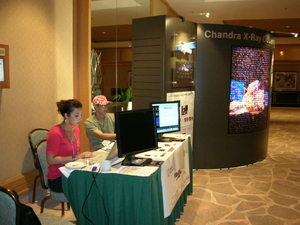 The Chandra Source Catalog (CSC) is a general purpose virtual X-ray astrophysics facility that provides access to a carefully selected set of generally useful quantities for individual X-ray sources, and is designed to satisfy the needs of a broad-based group of scientists, including those who may be less familiar with astronomical data analysis in the X-ray regime. The first release of the CSC includes information about 94,676 distinct X-ray sources detected in a subset of public ACIS imaging observations from roughly the first eight years of the Chandra mission. 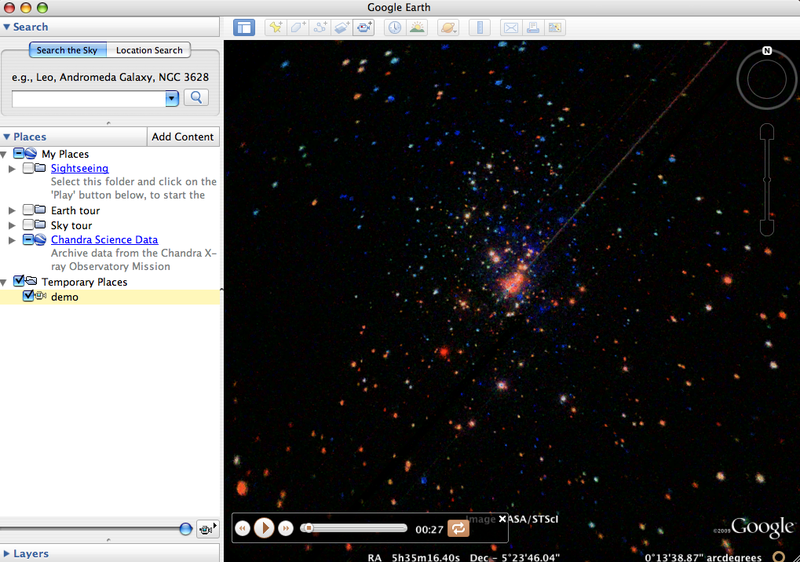 This release of the catalog includes point and compact sources with observed spatial extents <= 30". The catalog (1) provides access to estimates of the X-ray source properties for detected sources with good scientific fidelity; (2) facilitates analysis of a wide range of statistical properties for classes of X-ray sources; and (3) provides efficient access to calibrated observational data and ancillary data products for individual X-ray sources. The catalog includes real X-ray sources detected with flux estimates that are at least 3 times their estimated 1σ uncertainties in at least one energy band, while maintaining the number of spurious sources at a level of <=1 false source per field for a 100 ks observation. For each detected source, the CSC provides commonly tabulated quantities, including source position, extent, multi-band fluxes, hardness ratios, and variability statistics. 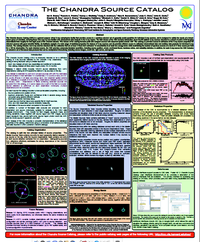 In addition, for each X-ray source the CSC includes an extensive set of file-based data products that can be manipulated interactively, including source images, event lists, light curves, and spectra. 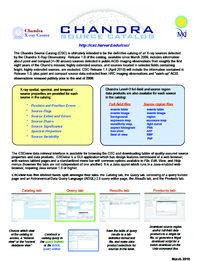 The CSCview data mining interface is available for browsing the Chandra Source Catalog (CSC) and downloading tables of quality-assured source properties and data products. Once the desired source properties and search criteria are entered into the CSCview query form, the resulting source matches are returned in a table along with the values of the requested source properties for each source. 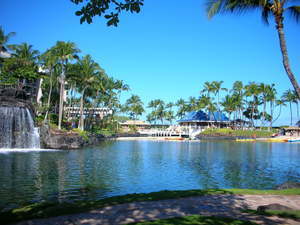 (The catalog can be searched on any source property, not just position.) At this point, the table of search results may be saved to a text file, and the available data products for each source may be downloaded. CSCview save files are output in RDB-like and VOTable format. 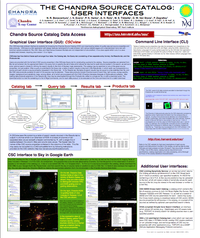 The available CSC data products include event files, spectra, lightcurves, and images, all of which are processed with the CIAO software. CSC data may also be accessed non-interactively with Unix command-line tools such as cURL and Wget, using ADQL 2.0 query syntax. In fact, CSCview features a separate ADQL query form for those who wish to specify this type of query within the GUI. 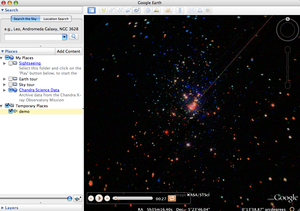 Several interfaces are available for learning if a source is included in the catalog (in addition to CSCview): 1) the CSC interface to Sky in Google Earth shows the footprint of each Chandra observation on the sky, along with the CSC footprint for comparison (CSC source properties are also accessible when a source within a Chandra field-of-view is clicked); 2) the CSC Limiting Sensitivity online tool indicates if a source at an input celestial location was too faint for detection; 3) an IVOA Simple Cone Search interface locates all CSC sources within a specified radius of an R.A. and Dec.; and 4) the CSC-SDSS cross-match service returns the list of sources common to the CSC and SDSS, either all such sources or a subset based on search criteria.